Texas is home to a number of desert mule deer. These mulies are found in the trans-Pecos mountain region of far west Texas and the Palo Duro Canyon area in the panhandle region of North Texas. Many of the mature bucks harvested in these areas are matching what is currently coming out of the Rocky Mountain states. Hunters do not have to draw for a hunting license, nor do they have to pick a certain set of days to hunt like most mountain states. Hunters usually can hunt in a comfortable climate, free of snow, and deep mud as often found in the Rocky Mountains. In addition, hunters may hunt out of a vehicle safari style and have the opportunity to see additional game during their hunt. Some of these include; whitetail deer, elk, mountain lion, bobcat, coyote, javelina and herds of aoudad sheep. Our hunters will enjoy hunting this historic 14,000 acre private ranch nestled within the famous Glass Mountains near Marathon, Texas. This ranch is home to many mule deer, pockets of whitetail deer, free range wild elk, large herds of free range aoudad sheep, javelina, and mountain lion. All of our ranch is huntable territory and hunters will enjoy having an opportunity for a mixed bag hunt that never gets boring. Mule Deer bucks range from 150-190 B&C. Elk Bulls run from 285-325 B&C with big Aoudad Rams pushing past 33 inches. 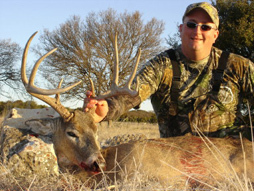 Our mule deer hunter's Texas hunting license is good for all of these many species of big game. Come and enjoy yourself where you can keep on hunting after your guide helps you tag your big mulie buck! We leave our hunting lodges at or before first light and return late morning for lunch. After lunch, we once again head out into the field for the afternoon hunt. Hunting is conducted primarily safari-style out of 4WD trucks, jeeps and ATV's with frequent stops to glass nearby mountains and canyons for game. Walking and stalking called "still hunting" along with spending time overlooking a favortie afternoon watering hole are also excellent methods of locating big bucks. Most shooting opportunites are at distances under 200 yards while some shot opportunities may be further. "Mountain Hunting" may require hunters to shoot resting their rifles on shooting sticks, bipods, or over the top of their guide's backpack. In preparation for their trip, hunters may want to consider practicing their shooting from similiar rests to help prevent a "missed opportunity" when it's "show time"! The weather is usually stable with morning lows around 25 degrees heating up quickly into the low 60's. Wind can be a factor but seldom is there any rain. Hunters may want to consider dressing in layers to better contend with the changing temperatures of the day. We indulge our hunters with the very best in Southwestern style cuisine prepared fresh daily by Magnum Chefs, comfortable private lodging, professional and experienced guides, trophy care to include dress, skin, and shoulder cape our your prize along with digital photos to commemorate your hunt. Not included are personal hunting equipment, adult beverages which can be stocked to order upon request, Texas hunting license which can be purchased ahead of time from Magnum Guide Service or the Texas Parks & Wildlife Department, transportation to the lodge, camp gratuities, any meat processing or crating and shipping of meat or trophies, which can be arranged.